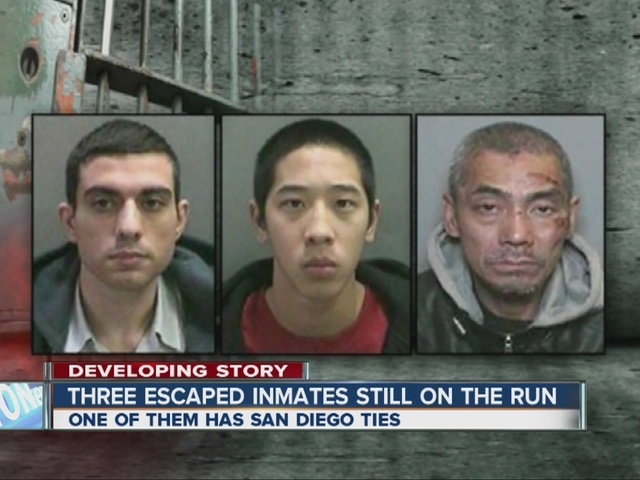 SANTA ANA -- A manhunt continued Monday for three "very dangerous" detainees who escaped from the Central Men's Jail in Santa Ana -- roughly 16 hours before they were discovered missing, authorities said. 10News learned Sunday that one of the escaped inmates, 43-year-old Bac Duong, lived at an apartment complex in the 4100 block of Chamoune Avenue in City Heights in the 1990s. 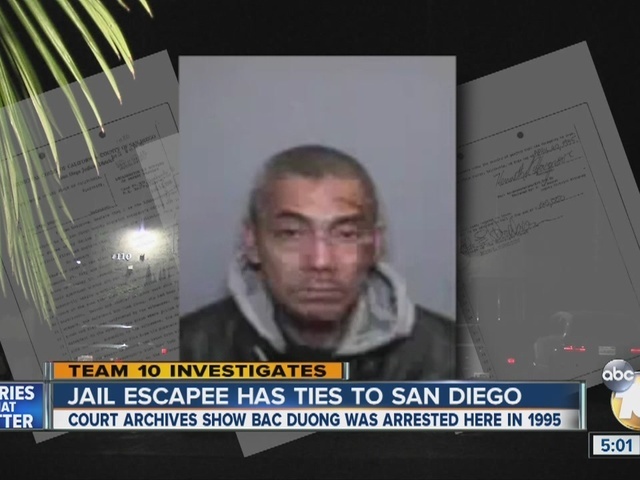 Team 10 checked court records and found microfilm that shows Duong was arrested in 1995 as he tried to steal items from inside a pick-up parked outside the complex. According to court documents, witnesses captured Duong and held him until police arrived. He was charged with burglary of a vehicle and petty theft, and was sentenced to 180 days in jail. Duong’s arrest record includes 22 criminal filings, most of them in Orange County. They include a 2006 arrest for carjacking and car theft while in possession of a deadly weapon and various drug charges. Duong, 43, currently a resident of Santa Ana, faced an attempted murder charge and was being held without bail on an immigration hold pending a possible federal deportation hearing. The men cut through a steel grate, half-inch steel bars and plumbing tunnels early Friday before making their way to an unsecured part of the jail's roof and using makeshift ropes to rappel several floors to the ground, officials said. The public should "presume they are armed," Sheriff Sandra Hutchens said at a Sunday morning news conference. "They had some tools. Where they got those tools and how they got them, we do not know that," Hutchens said. Sheriff's department spokesman Jeff Hallock said that the men, who were awaiting trial on charges ranging from murder to attempted murder to torture, are believed to have escaped shortly after a 5 a.m. physical body count, one of two that take place each day at the facility. They weren't found to be missing until about 9 p.m. Friday, during the second daily headcount, which was to have started at 8 p.m. but was delayed by an altercation possibly staged to help delay discovery of the escape, Hallock said. Hossein Nayeri, 37, of Newport Beach, faced charges of kidnapping and torture for the abduction of a marijuana clinic owner who Nayeri allegedly drove to the desert and burned with a blowtorch. Nayeri fled the U.S. and was arrested in the Czech capital of Prague, then returned to Santa Ana to await trial. Jonathan Tieu, 20, of Fountain Valley, faced a murder charge in connection with a gang hit, prosecutors said. Tieu's mother and sister went on KABC7 to beg him to turn himself in to authorities. "Please just turn yourself in," said sister Tiffany Tieu. "Don't let this drag on." The relatives said he did not kill anyone and that they believed he did not take part in planning the escape. "I feel he was manipulated or tricked into during this," Tieu said. At least two of escapees had spent enough time at the jail to engineer a sophisticated escape, Hallock said, describing the breakout as "well thought out" and possibly the result of weeks or even months of planning. Steps have been taken since the escape to harden the facility against any more, Hallock said. The sheriff's department released photos and a video that show, among other things, a cut quarter-inch steel grate inside the dormitory-style "tank" of about 60 inmates from which the inmates escaped, one of several makeshift ropes -- this one found inside the tank after the escape, and what's believed to be at least one of the suspects on the jail roof in the pre-dawn darkness. After reaching the ground, the suspects fled on foot, investigators believe. Rewards were offered -- $20,000 by the FBI and $30,000 by the U.S. Marshals Service -- for information leading to the capture of the three men. "We have had a number of very good tips that have got us on a good path, but as for actual sightings of these individuals, we have not (had any)," Hutchens said. "We continue to have three escapees who are very dangerous and I want to tell the public presume they are armed," she said. The jail complex -- which dates to 1968 and lacks some in-house services that are features of more secure modern jails and prisons -- consists of three facilities housing about 900 inmates. Conducting numerous head counts during the day is not possible because detainees are in and out of the jail for various reasons, including court appearances and medical checks and treatment, Hutchens said. The entire complex is maximum security. There have been two prior escapes from the jail, both more than 20 years ago. It's unclear whether the suspects had any help from the outside or if other inmates were involved in the escape, the sheriff said Sunday, but Hallock said the cut steel grate and makeshift linen rope depicted in the photographs were found in the tank, where other inmates would have been present. The sheriff's department, Orange County District Attorney's Office and Probation Department, the U.S. Marshals Service and the FBI are involved in the search, which Hallock called "a 24-7 operation until these three individuals are caught." Anyone who sees any of the suspects should call 911 immediately, and anyone with information regarding their possible whereabouts was urged to call a special hotline at 714-628-7085. Anonymous tips can be provided by calling Orange County Crime Stoppers at 855-TIP-OCCS.